Can Washington's Solar Boom Survive the Legislative Stalemate? Financial incentives are driving locals to install rooftop solar. But an expiring state tax break could halt the growth. Isn’t Seattle a little cloudy for solar power? That’s a question Reeves Clippard hears often as the CEO and cofounder of A&R Solar, a Seattle-based solar installation company for residential and commercial clients. “It’s a common misconception,” he says, “but there’s no technical reason for solar not to be adopted here.” He points to Germany, which receives a similar amount of sunlight as the Pacific Northwest and is a global leader in solar generation. 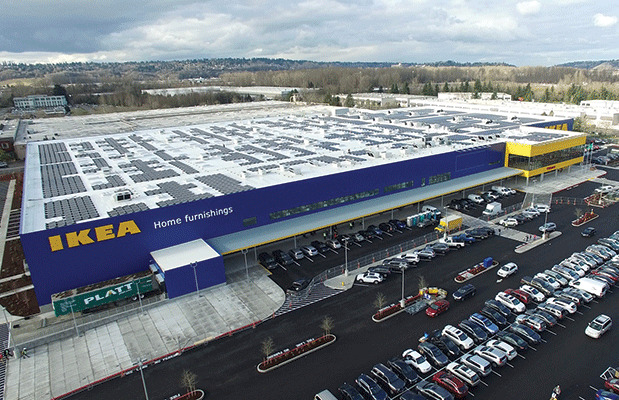 Clippard had a chance to boost western Washington’s image as solar-worthy in January, when A&R installed the largest rooftop solar array in the state at Ikea’s new store in Renton. The installation comprises 244,000 square feet of solar panels, and is projected to produce 1,261,000 kilowatt hours (kWh) of electricity annually for the store—enough to power 131 homes each year. It’s the 45th solar project in the U.S. for Ikea, which has a goal of energy independence for all of its stores by 2020. The company is in on a growing trend: Nationwide, the solar market had its biggest expansion ever in 2016, with a 95 percent growth increase over the previous year. For Clippard, the retailer’s panels are significant as a visible symbol that solar works in our cloudy region. “A project like Ikea is showing everyone in the Northwest that solar’s viable, it’s here, and the time to do it is now,” says Clippard. Commercial installations have been popping up in the Seattle area, and homeowners have been adding solar faster than ever in the past decade. According to Seattle City Light (SCL) and others, the increase has happened primarily because of federal and state incentives that began in 2005, as well as a decline in the cost of the panels. “They’re cheaper for a few reasons,” says Joan Schrammeck, who is on the board of Solar Washington, a nonprofit working to advance solar in our state, and who also works for Fire Mountain Solar, a Skagit Valley design and installation firm. Components, specifically silicon cells used in the panel, have come down in cost, and the efficiency of the panels themselves has improved. “You actually get more kilowatt hours out of each solar panel made now than you did from one made five years ago,” explains Schrammeck. Consequently, homeowners don’t need to invest in as many panels to meet their energy goals. While early solar adopters in our area were likely investing for environmental reasons, today, penny pinching can be an equally good reason, at least while incentives continue. Our state’s cheap electricity, a benefit of the hydroelectric power generated at the Grand Coulee Dam on the Columbia River, has been one barrier to convincing more people to invest in solar to save on energy bills. That dam produces more hydroelectric power than anywhere else in the United States, and the state generates more power than is consumed each year. However, the newer incentives have been encouraging. One of them, the federal incentive, is delivered in the form of a 30 percent tax credit; the other is a state production incentive provided through utilities that, depending on how much power a solar installation produces, can generate a financial credit. Currently, there is also no sales tax on the panels in Washington. There’s a hitch in the progress, however—state solar incentives could go away if they aren’t stabilized during the current legislative special session. “We need a clear and stable and predictable program for the future,” says Schrammeck. The number of home solar installations flattened last year, after increasing by 30–40 percent in 2014 and 2015, most likely because the state incentive ends in 2020. However, Jake Wade, SCL renewable energy program manager, says solar is likely to continue some growth here, no matter what happens with legislation. “Solar keeps dropping in cost, and we’ll still have the federal tax credit,” he says. Those are two really big drivers.” About 600 SCL customers installed solar in 2015, and a few more than 2,700 customers had done so as of February 2017. The cost of solar is similar to the cost of a new car for most homeowners, says Clippard: typically $15,000 to $40,000, depending on how much energy a homeowner wants to offset, how many panels can fit on a roof and how much energy a household uses (if you generate more energy than you consume, the household receives a kWh credit and the extra energy is sent back to the grid). Solar skeptics might want to speak to Tom Carpenter and Marina King, who installed a system on the roof of their 1920s bungalow in South Seattle’s Hillman City in February 2014. The morning after a February snowstorm, Carpenter checked the electric meter outside and noted that it was still generating electricity, even though snow was covering almost a third of the solar array. The Carpenters live in a 2,000-square-foot house, with three bedrooms and a mother-in-law studio apartment in the basement. Their solar-panel system is small, covering about a third of the roof and generating 3.2 kW per hour; it cost them only $11,500 after rebates and the federal tax credit. The Carpenters get a production incentive of about $1,200 from the utility each year and have received it since they installed the system in February 2014. “I wanted to go solar to have less of an impact on the planet,” says Carpenter, who also saved energy by adding insulation to his house. Carpenter estimates that their solar investment will be paid off in two more years, and then, “It will all be gravy,” he says. Panels last 20–25 years or longer. Paula Jenson, who had a solar-energy system installed on her Ballard rooftop last year, says there’s another appealing aspect of generating your own power: Modern systems can be hooked up to an online meter such as eGauge, which can display energy being generated and used, down to specific appliances. “It appeals to the geek in us,” she says. Her husband, Robin Waples, pops opens the laptop on his dining room table to display the day’s solar production. The graph for a dreary week in early February shows a lot of red, for net energy use. Even so, there are some times during nearly each day of the week when the lines are dark green: “That means generating more energy than is used,” he says. Jenson and Waples bought their system for about $14,000 after several incentives, which included two extra solar panels that were part of a promotion from their installer, Sunergy Systems. The bump in solar in Washington has created new businesses in the state, from new manufacturing—like the Bellingham solar panel manufacturer Itek Energy, that began full production in 2011—to solar installers like A&R. Louise Petruzzella, director of the Clean Energy Technology & Entrepreneurship program at Shoreline Community College, says her program started in 2008 and focuses on teaching students to design solar array systems, primarily for residential rooftops. “Many students were coming to the program having just lost their jobs,” she says, noting that the program started after the Great Recession. Many students were retrained to go on to solar careers, and more than 300 have graduated from the program. The solar surge has been good to them. “If they want a job, they definitely have a job at this point,” says Petruzzella. Solar boosters like Schrammeck hope the state Legislature will continue the clean energy momentum. “The incentive has worked great for growing jobs, worked great for solar investment, worked great for manufacturing,” she says. It seems to be working great for homeowners, too. For renters, or homeowners who can’t install solar because of cost or practicality, there are ways to jump on the solar bandwagon. Seattle City Light piloted Washington’s first utility-owned community solar programs, in partnership with the nonprofit Northwest SEED. “Community solar allows renters, people without solar-compatible roofs or those not ready to install their own systems to reap the benefits of solar by purchasing a piece of a collectively owned solar array,” says Camilla Walter, development manager for Northwest SEED. Participants get credits from the utility for the power generated from their portion of the solar array. Such projects have been placed at the Seattle Aquarium, in Jefferson Park and in a few other locations around Seattle. As of 2016, Washington has 73 community solar projects, totaling 2.8 megawatts of capacity in 30 cities.Seattle’s current community solar projects are filled, but there are others in Washington state, and if the new solar bill legislation passes, there should be more to come. Seattle also has a “solar powerhouse on wheels” available for rent: Northwest Solar Rover (nwsolarrover.com). It works like a gas generator, without the pollution, providing power for weddings, parties, music festivals and disaster relief.